Secrets of the Magic Ring by Karen McQuestion. Sequel to Celia and the Fairies. Review: Have you ever imagined of one day possessing an object that would grant your dearest wish? 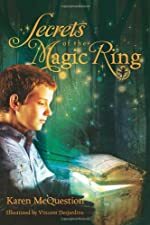 In Secrets of the Magic Ring by Karen McQuestion, the sequel to Celia and the Fairies that depicts what happens in a world in habituated by fairies, a boy named Paul seems to have discovered a ring that is just that. In Secrets of the Magic Ring you will learn about the strange things that happen to Paul, as well as his friends and family, after his discovery of his new treasure, a magic ring. Secrets of the Magic Ring may be Karen McQustion's best book of all time. It begins during the installation of Paul's new pool, generous gift for his 9th birthday from his Aunt Vicky, when he notices a square shaped object buried in the wall of ground. Once Paul learns of the object he decides to get it out of the ground and find out what it is. Unbeknownst to his parents, he retrieves the object only to be confronted by a strange boy named Henry, who demands to be given the new treasure, but is scared off by Paul's dog Clem. Within the Watchful Woods is the fairy Jasmine, whose job is to oversee Paul's family and it, is Jasmine who gets Clem to frighten Henry. Once Paul opens the box he finds a gold ring with a sparkling blue gem in the middle inscribed "Be Selfless." Within the middle of the ring is a rolled up piece of paper that tells Paul how it cold bestow the wearer their most fervently wished-for ability, and that there is only one use per wearer. Later, while wearing the ring Vicky falls into the pool and in an instant can swim, which she feared doing most of her life. Also, later when Clem retrieves the ring for Paul, he gains the ability to talk, and eventually Paul himself gains the ability to fly. The magic ring has amazing power, but is shrouded in mystery. Who really was Henry? What else will become of the ring, and the fairies that live in the woods? Read Secrets of the Magic Ring to find out! Secrets of the Magic Ring is a great book for lovers of fantasy regardless of age. It deserves 5 out of 5 stars because of how it well depicts dreams coming true. For example, how almost ever y person feared to do something but could never will them self to do so and then by chance accomplishing it, like aunt Vicky did when she became a swimmer in an instant or how Clem could be understood and talk. Also, how at some point everyone has probably dreamed of flying, and how it came true for Paul. Additionally, this book provides vivid details about the settings and characters. For instance, "the weather was hot, but it was cool in the shade, and they could always use their wings to generate a slight breeze if need be." described how the weather was like for the fairies as they had a conversation about the ring. Secrets of the Magic Ring is a outstanding book to read any time anywhere. We would like to thank Karen McQuestion for providing a copy of Secrets of the Magic Ring for this review. Have you read Secrets of the Magic Ring? How would you rate it? Wow! What a terrific review. Thanks so much, Matthew, for reading the book and sharing your thoughts on it. You did an excellent job. And a big thank you to Book Trends, for posting the review.